SHOW OFF YOUR WRIST CANDY AND WIN!!!! LUV to stack em up and never take them off! a personal story to carry with you everywhere! im sure you all will LOVE! 1.Take a pic of your best Wrist Candy "one pic"
All images will be uploaded on FG10's Album Titled "WRIST CANDY"
The picture with the MOST "likes" will WIN! yup.. all of you will get the Chance to VOTE for your FAvorite! Courtesy of some of my FAvorite designers! 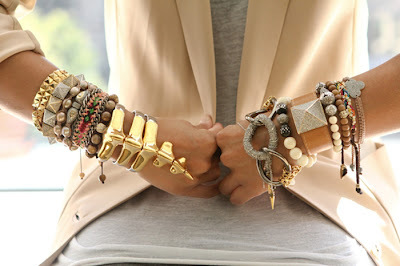 to create THE BEST wrist candy that ever exsisted! by the 14th of Saturday you will see your PRIZE! wow !! is rings included ? ?